English Championship final hero George Pinner admits he was racked by self-doubt as he prepared to help Beeston defend their title over the weekend. It was left to Ben Arnold to coolly make it 3-1 with the winning penalty. "I was nervous coming into the weekend. It's the little things you're not used to after a spell out," said Pinner. Surbiton also needed a shoot-out to clinch third place after their play-off with Reading finished 1-1. David Kettle denied Jonty Clarke to seal a 3-2 victory after Michael Watt, Alan Forsyth and Chris Grassick all netted for Surbiton. "I came out here and went easy on myself, and thought 'if mistakes happen they happen'. I just had to give it my best, and luckily it has been a fairly successful weekend for myself and the team." "I love a shoot-out, the victory feels really sweet." Beeston finished second to East Grinstead in the league, and booked their place in Sunday's final at Reading with a 4-2 semi-final win over the hosts on Saturday. Sam Ward put the Bees ahead in the final with a drag flick on five minutes, with East Grinstead hitting back through Andy Piper before the end of the first quarter. Both Pinner and Richard Potton at the other end made a string of fine saves to force the title into a shoot-out decider. "East Grinstead finished first, but were were the only team to beat them twice in the league," said Pinner. "We were determined to make it a third time and prove that we the better team. We have now got our second title in a row and it's a brilliant feeling." Pinner is one of six Beeston players named in Bobby Crutchley's 22-man England squad to face Ireland in the Nations Cup at Reading on Thursday. 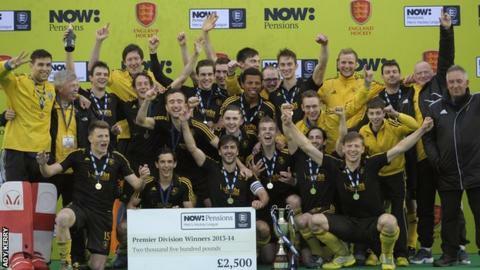 "We had a brilliant winter with England at the World League, getting a bronze medal," said Pinner. "We've had a block of training the last few weeks, which I've missed, but we are looking forward to getting stuck into the summer, starting with what what is going to be a brilliant event on Thursday night in what sounds like will be a sell-out home crowd."